Very soon, it is conference time again, at SQLBits. As our team is preparing for this big event, I took a hard look at the slides we are using and the design we apply. While you may argue that spending time on slide design is a waste. I beg to differ. Using slides that are easily readable, beautiful and speak with clarity is important: No matter how great your content is, my experience shows that the audience will also judge you on the quality of the slide material you use. I will also assert that that most people are visual learners, so you owe it to your audience to use well designed slides. But even if you still disagree and if you don’t believe good slides help visual learners, consider this simple observation: if your slides look sloppy, it reflects on your character. 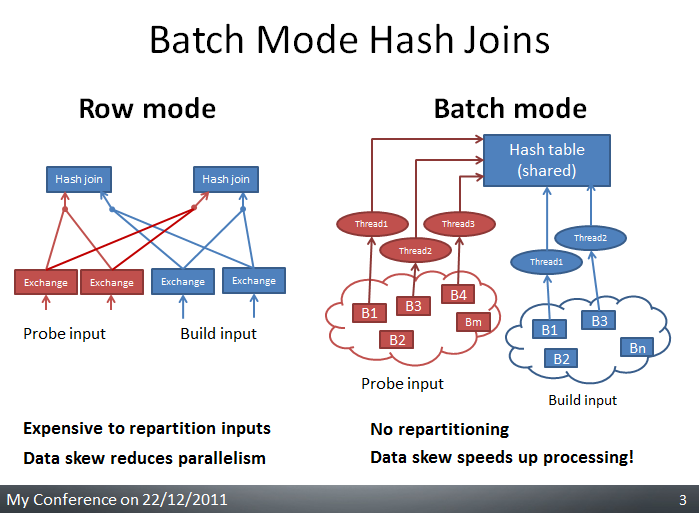 The first observation is that this slide makes some quite profound points (which I will delve into during SQLBits). The content is good. But the design is quite poor. Contrast is poor, the white text on yellow background is almost unreadable. Let’s try to improve this. First of all, let me apply a bright background and increase the contrast to make it more readable. 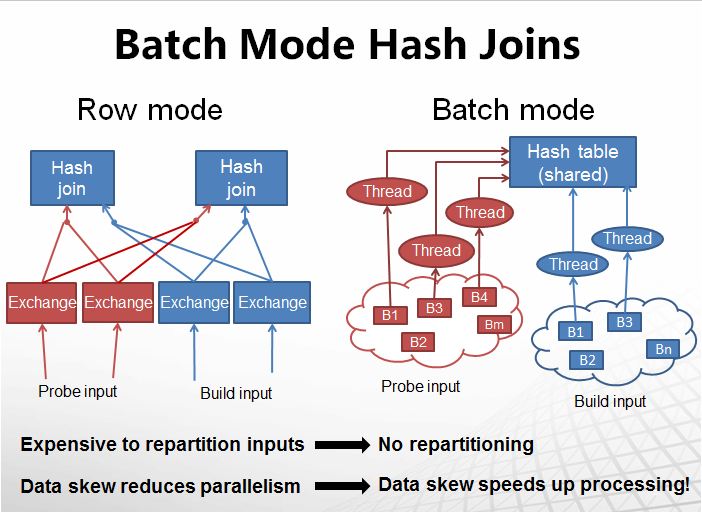 Let me also clean up the inconsistent use of bullets and align the headers of each side of the slide. I will also use a colour scheme with much more contrast. I made some minor corrections in the header too – title casing and removing the load balancing (which is a very overloaded term). The slide compares two different situations with each other – a before/after picture. This is a very powerful presentation method, and the creator of the slide has a great point here that I want to highlight. But, the contrast of the two sides is not clear from the layout. I want to make this contrast stand out. 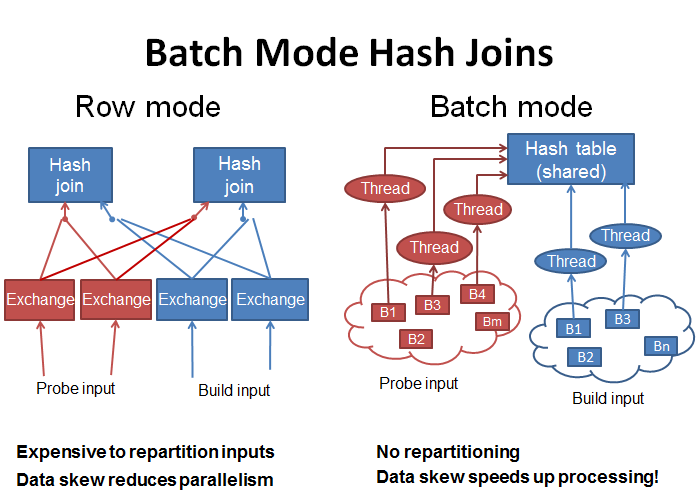 In this second iteration of the slide, I increased the size of the two sub-headers (“Row Mode” and “Batch Mode”) to direct the reader’s attention to the fact that we are dealing with two different concepts. The two text lines below each illustration are also important points and I boldfaced them to make them stand out more. 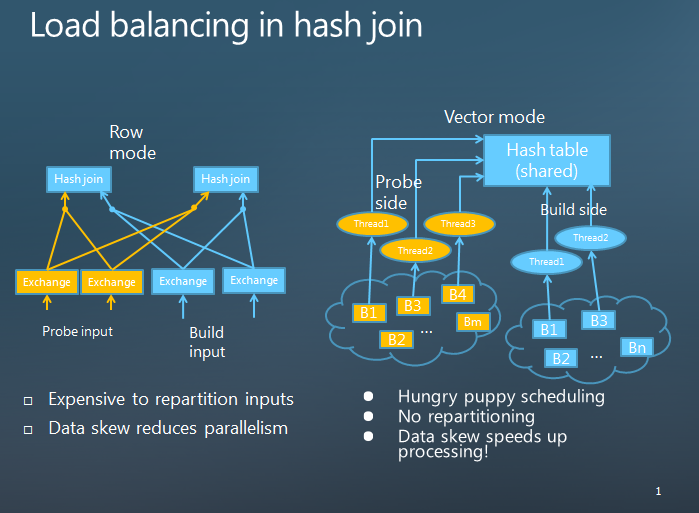 In the slide, the differences in “probe input” and “build input” are also important. But the slide does not make the best use of this information. First of all, the left side uses the term: “Probe Input” while the right side uses the term “Probe Side” – even though they are the same concept. Second, the probe build/side text is located at the bottom of the illustration on the left side, and at the top on the right side. I moved them to the same location, the bottom of the slide, and made use the same text on both sides. The contrast between the two sides is much clearer now don’t you think? Notice that I did something which is typical of my slides: adding a footer with information. But as I was doing this, it made me reconsider this technique. Why is footer needed? If you are sitting in the room, chances are you probably KNOW which conference you are in – and knowing today’s date is not of much use. Putting information like that in the slide is just distraction for the precious attention of the audience, and a waste of slide space. Having slide numbers is debatable. In favour of them, they make references to printed material easier. But it is a double edged sword, if you change your slides last minute (as I like to do) those references will be off. The usage of fonts is far from optimal in the slide. Even after improving contrast, I doubt the slide will look good from a distance. And we want to reach those people hiding all the way at the back of the room too. Removing the footer also gives me more air on the slide to play with – allowing me to use bigger fonts. Typographical rules dictate that one should reduce the number of fonts and font sizes in a work of graphical design. I decided to use Helvetica as my slide font and Calibri as the header. Helvetica is the font of champions, it looks amazing both in print and on the screen. Arial is a discount version of Helvetica, don’t settle for it if you have Helvetica. For the slide text, I used only 16pt and 18pt sized font, big enough to read from a distance. It will be clear soon why I chose Calibri for the header font, but for now, suffice to say that it is good that the header stands out in a different font than the main text. Note how much larger the text is and how uncluttered it has become. More readable text in the same space. 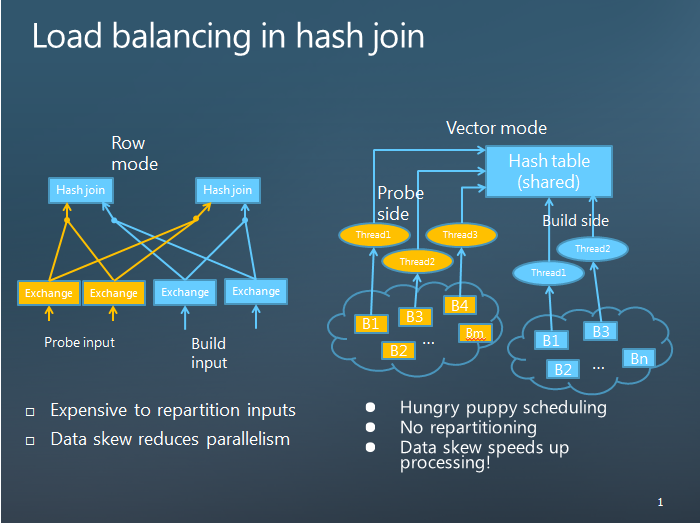 The slide is much more readable now, but it is not really clear that this slide comes from the SQL Server product group. It would be tempting to slap a big Microsoft logo in there. But I think this leads to clutter. If you observe Apple’s branding , you will see that they use a very understated look. Yet, when you hold an Apple product in your hand, you are not in doubt who made it. I think we can use a similar principle of "cool minimalism" for the slides. We need to give it that SQL Server feel, while maintaining a clean look. Let me take a look at some of the themes of SQL server. First of all, Microsoft uses the "wavy logo" as seen to the right. I think that is rather cool and it looks high tech – the look I am after. But instead of slapping it directly on the slide, let us make it subtle, in the background image. Gray scaling the logo and putting it on a white background makes it discreet, without interrupting the contrast of the slide. Please don’t use high contrast background pictures, they really annoy the eyes. I tried identifying the font, and I think it is Calibri in bold (The big “Q” gives it away). Changing the headers to this font gives it that familiar look we are after, without doing the obvious thing of adding a logo directly. 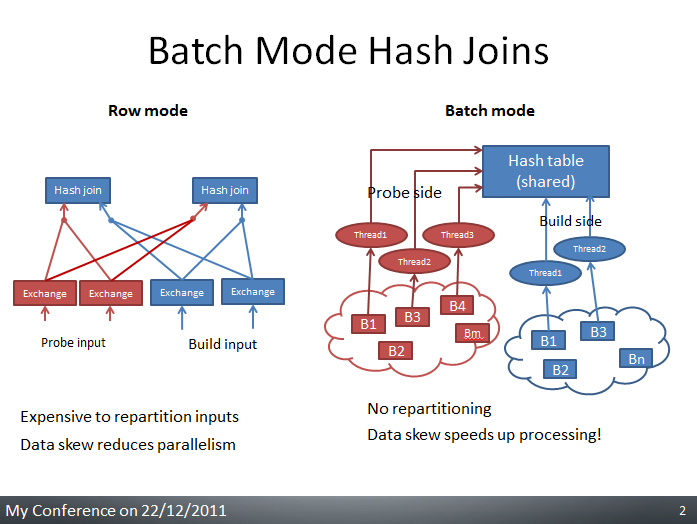 Notice that I also added arrows to show the important transition between the row and batch side of the comparison. It gives the slide some “movement” (and I will animate it). The additional space at the bottom made available by the redesign really highlight the important parts of the slide. Even at a scale fitted to this blog, the readability improvements should be obvious. The new layout have been saved as a template that we can use in the team to get a consistent look. Hopefully, SQLBits will have our prettiest slides yet, as well as our best content. Good info, I wasn’t aware of that. I agree with you point good slide makes lot of difference in the presentation. I use a mild light background and dark font. It fits in both dark and light rooms. Thans for your comment Ayyappn. Could you share an example of your slides to I can get inspiration on how you get good contrast with your colour schemes please. I agree with everything but the color. When you are projecting in a dark room, having a dark background for your slide makes slide more readable. Of course this is not true when you watch slide printed or displayed on a monitor, but the projection at a conference is a different thing. It is true that, if you are in a room with natural light then white background is better. But most of the conferences are held in darker rooms. If you haven’t already read, you should read the book “The Presentation Secrets of Steve Jobs: How to Be Insanely Great in Front of Any Audience”. It has some very good points about PowerPoint slides (and other things as well).